A tornado that formed in Colorado's high-country on Saturday, July 28, 2012 was estimated by National Weather Service as the second-highest tornado ever recorded in the U.S. There were four different reported sightings of the high-altitude hit the northeast side of Mount Evans - a prominent mountain located about 96 km west of Denver. The NWS estimates the tornado's touched down at about 3.62 km (11,900 feet) in elevation. Bob Glancy, a National Weather Service meteorologist in Boulder, Colo., told NBC News that this tornado above the treeline is "not unheard of," but "just unusual." Most tornadoes in high terrain are weak, he said. For the last two decades, Colorado has averaged 50 tornadoes a year. But Glancy said the "vast majority" occur on the plains east of Interstate 25. 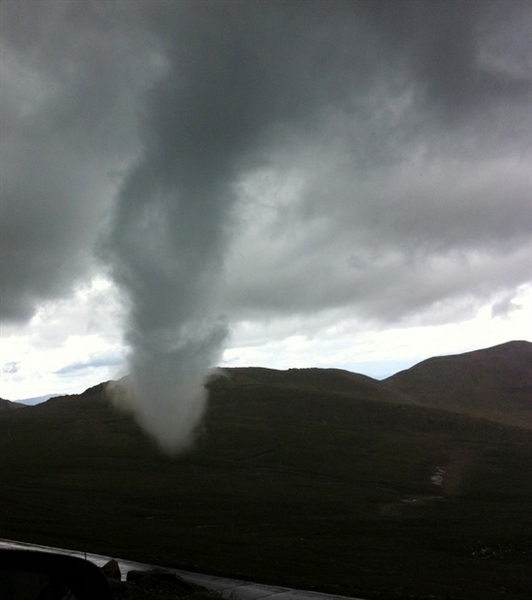 Colorado Springs resident Josh Deere told The Denver Post he saw the funnel as he was driving with his family to the top of Mount Evans. "As we drove past it, we were able to look back and had some spectacular views of it as it spun and then eventually broke up as it entered the mountain cove," Deere told the Post. The highest recorded tornado occurred in 2004, according to Glancy, over Rockwell Pass in California's Sequoia National Park. That twister was estimated to be at 3.65 - 3.8km (12,000 to 12,500 feet). Latest news from NWS said that the Monsoon is in full swing across portions of the Southwest and Great Basin early this week. Heavy rainfall from afternoon thunderstorms will have the potential to cause flash floods, debris flows and road washouts through at least Tuesday, July 31. A Flash Flood Watch is in effect for portions of southern Utah, southern Nevada, southeast California and western Arizona. 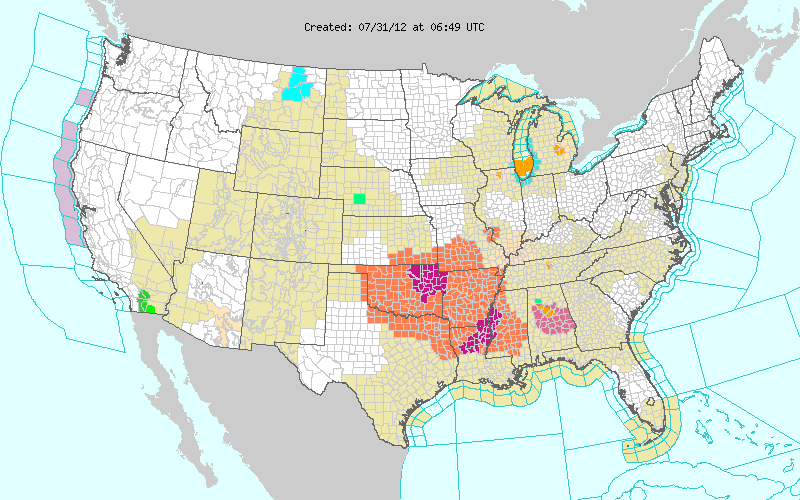 Dangerous heat will continue across the South Central U.S. for the next few days. Widely scattered thunderstorms along a weakening frontal boundary stretched through the region could provide some brief periods of relief from the heat. However, for the most locations daytime temperatures will yet again soar towards triple digits on Tuesday and Wednesday. Pockets of energy rounding the western side of the upper ridge centered over the Central U.S and combined with an abundance of monsoonal moisture...will continue to fuel widespread afternoon showers and thunderstorms across the desert southwest. Flooding and flash flooding will be possible across the region...especially over western Arizona where heavy convective rains are expected to develop. Featured image courtesy of Josh Deere.